To honor the classic tradition of “Afternoon Tea” and celebrate its 30th anniversary, The Tremont House, A Wyndham Grand® Hotel, will revive the tradition and host the first of quarterly afternoon teas on Sunday, March 8 from 3:00 to 5:00 p.m. The hotel is also offering a special Tremont Tea Society Package including afternoon tea for two, accommodations for two on Sunday night and valet parking starting at $196. Imagine chatting with friends in a sundrenched atrium while nibbling on tea sandwiches and scones. To whet your palette you’ll sip tea or possibly champagne. Then as the afternoon winds down, choose from assorted petite fours and tasty macaroons. All while a live harpist plays softly in the background. 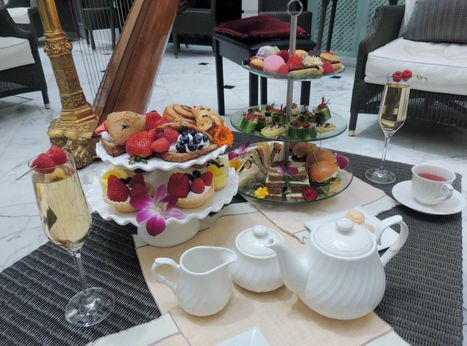 Afternoon Tea includes standard tea service and a performance by harpist Jill Bosworth. It is available by advanced reservation for $40 per person for standard tea service and $50 per person for the option of champagne, mimosas or wine. The menu features two salads including chicken, apples and raisins in endive and feta, Kalamata olives, and grape tomato served in a cucumber cup. Guests can also enjoy tea sandwiches comprised of cucumber mint on rye bread; tomato, basil and mozzarella on sourdough bread; prosciutto and asparagus on white bread; and roasted beef, horseradish cream and arugula on mini brioche. Baked goods including banana nut bread and assorted scones and pastries, served with flavored sweet butter cream, Devonshire cream and assorted preserves are also on the menu. Tea concludes with assorted sweets served in a beautiful display of petite fours, mini assorted cheese cakes, macaroons and tarts. 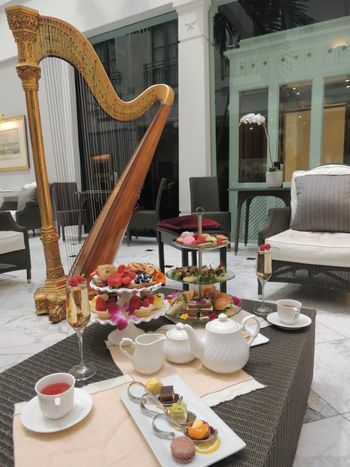 Tea options include Earl Grey, Assam Black Tea grown in the India, Ceylon Black Tea/Sri Lankan Black Tea, Chamomile Tea, Mint Tea and Rose Congou Tea, selected to compliment the afternoon’s menu. The hotel is currently taking reservations for the March 8 Tea. Future teas are scheduled for June 14, 2015; Sept. 13. 2015; and Dec. 13, 2015. Advance reservations are required and can be made by calling (409) 763-0300. A limited number of seats are available, and an overnight package for Sunday night is available. To reserve the Tremont Tea Society Package, visit www.TheTremontHouse.com and see special offers. The Tremont House will host a series of quarterly Afternoon Teas in conjunction with its 30th Anniversary. Afternoon Tea is scheduled on March 8, June 14, Sept. 13 and Dec. 13, 2015. Photo courtesy of The Tremont House.